Many dogs especially the larger breeds have a tendency to wolf their dinner down like it is about to be taken from them. They swallow it without chewing and then many times will either throw it up or cause digestive disturbances such as bloat and gas. For many dogs this can be very dangerous but for many it simply makes them hard to live with for the gassy smell! My dog Sasha loved to wolf her food down, and would look stunned when 10 minutes later it came back up undigested and usually on the carpet. I tried giving her smaller bits at a time but she just watched my hand. So, many dog owners are having huge success with a slow feed dog bowl for the kibble. Below are a few different styles that are totally affordable. The first two models have the BEST REVIEWS! As I write this page my research shows that there have been over 4900 good reviews for this bowl. That makes this one the best based on reviews. The idea behind this style of bowl is that the kibble falls in between the rows which means your dog has to carefully grab at the kibble with their mouth not so wide open and their tongue. It allows them a few kibbles at a time and they are more likely to chew it and then move on to some more. 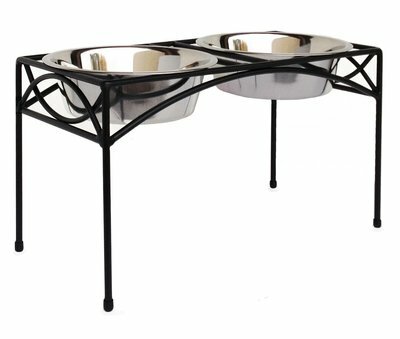 If you prefer stainless steel to plastic when it comes to feeding your pooch, this one fits the bill. This one is a bit more simplified with a lump in the middle which forces the kibble around the sides and he still has to grab it more carefully. This will help in two ways especially for larger dogs. Elevating takes the strain off their necks and stops them from laying down to eat which can cause bloat and gas all by itself, and still has the shapes inside to slow them down. This one has over 200 good reviews, and is shaped like a bone and your doggy has to pick out the kibbles. This one is getting closer to an interactive toy for treats, but is something a little different. You can get different sizes depending on the weight of your dog as many smaller dogs have the same problem. If we all want to live in harmony with our pets then we have to get rid of the burping, gas, bloating and vomiting that seems to occur with dogs that eat too fast. This was a brilliant invention in my opinion! 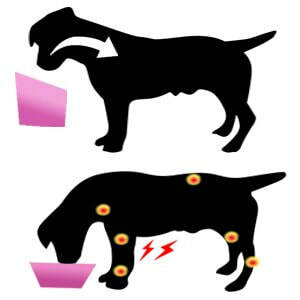 Not every dog eats as if it was his last supper, but many do, and the amount of money we spend on kibble that is supposed to reduce gas and bloat when in reality it is the speed and lack of chewing that causes many of these symptoms. Dogs tend to be opportunists, at least mine is! Even though she is full she will always be looking for the next treat or sniff out something edible in the snow bank that is disgusting or see what the kids have to offer. So it can be hard to control all of their digestive upsets, but we can control their daily dinner with a slow feeding bowl. They may not like it at first, but they will learn how to slow down feeding time with less mess. Try to feed them in a quiet spot away from traffic, and see if you can add at least 10 minutes to feeding time and actually hear some chewing you have success. 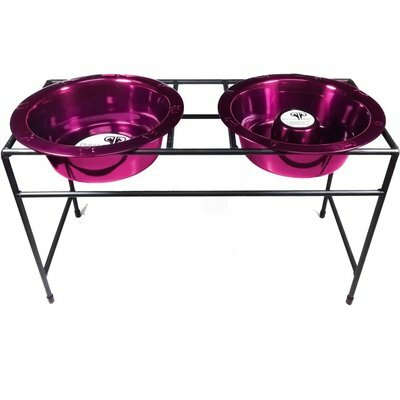 If in fact you have noticed your pet eats like he will never eat again, and you have the trouble with bloat and gas etc, then give one of these bowls a try before you start spending way too much on specialty foods. If after a week of eating slowly and you don't notice a different then get him checked out at the Veterinarian, but my own Veterinarian told me, that Sasha had to slow down to avoid the barfing. It may save you a lot of money as well as fresh air in your home and like me, hopefully save on carpet cleaning!